This is a service that I will perform for you, or a targeted person, to draw out fixed, crossed or jinxed conditions. Works well for The Evil Eye, hants and curses. This is an affordable, 5 day service which I perform on your behalf. It is simpler in execution but still provides wonderful results due to the extended period of time. I will need the symptoms you are experiencing, your full name, DOB and a photo if possible. ALL details must be provided in the "notes" section upon ordering. 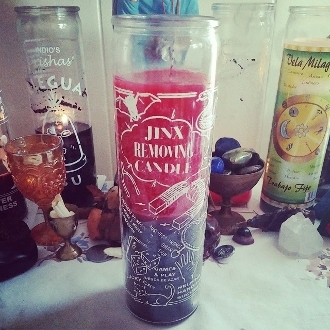 This service inclides the use of one fixed Uncrossing/Jinx Removing prayer candle. You will receive photos of the candle upon lighting it.